A deeper look at the grooves pressed into a vinyl copy of Diamond Dogs by David Bowie. While it might not sound like the greatest endorsement of an album’s quality or of the creative foresight possessed by an artist on the surface, the adage that Diamond Dogs exemplifies first is “Just because an idea doesn’t work out in its intended manner does not mean it should be thrown away and forgotten.” The manner in which David Bowie’s eighth album lives that phrase out is simple — as has been explained at length by other writers and critics several times over, Bowie’s initial vision for the album proved not to be what it became in the end, but what came from the arduous process of making Diamond Dogs proved to be a wellspring of inspiration which would sustain the singer for decades after the album’s release. After the album cycle to promote Pin Ups had run its course, David Bowie became interested in composing a concept album modelled around George Orwell’s science fiction dystopia novel, Nineteen Eighty-Four. As he began plotting the album in order to tell the story and writing the music, Bowie’s management team entered negotiations with Orwell’s family in order to legally complete the work and get their endorsement – however an agreement could not be reached and so the plug needed to be pulled on the project. That block was understandably disheartening but, rather than letting the work which had already gone into making Nineteen Eight-Four into a rock opera go to waste, Bowie kept working with and developing the music in a manner which downplayed any of the conceptual leanings that he had originally intended to include in the project. 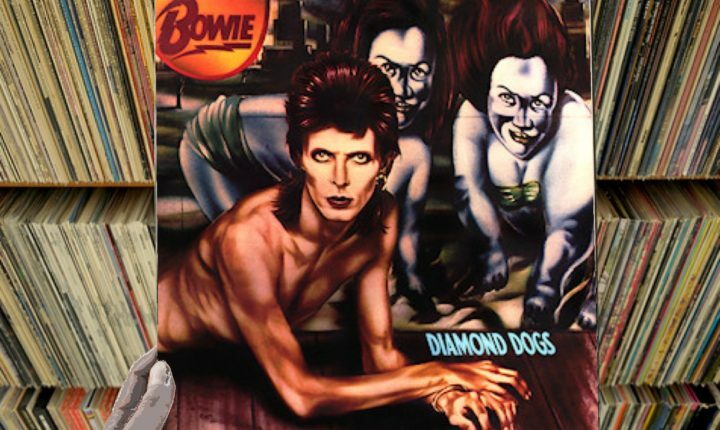 It came along and Diamond Dogs was born; to this day, it stands as a completely unique album in the context of the singer’s catalogue; it was the first album that Bowie produced himself, it remains the only album which features Bowie as the sole guitarist (while Earl Slick would contribute one guitar solo to “Rock ‘n’ Roll With Me” and Alan Parker played on the album’s title track, their influence is clearly negligible and in no way informs the record) and it is the first Bowie album which features a significant contribution from keyboardist Mike Garson [He appeared on “Aladdin Sanem” however he would begin to show up regularly in the years following this release –ed]. All of these elements are reasons why Diamond Dogs is is an important component in the Bowie dynasty but, even more importantly, Diamond Dogs would end up thematically informing virtually every album the singer would release after 1974 in one way or another – but we’ll come back to that later. As Diamond Dogs opens with a dramatic spoken-word piece, a scene is set and it is most definitely very different from the vibes that all of the seven albums which preceded it featured. “Future Legend” makes its way methodically/languidly along as really sets an impression, and listeners will begin to feel the chilly atmosphere set by lines like, “Fleas the size of rats sucked on rats the size of cats/ And ten thousand peoploids split into small tribes” pass through and decorate a nihilistic stage. Although Bowie had addressed themes of isolation several times over on the seven albums before it, this opening on Diamond Dogs abandons campy histrionics and inhabits some fantastic darkness, truly; somehow, listeners may be able to feel the hairs on the backs of their necks begin to stand as this imagery rolls out, but the deal is sealed when the dialogue is punctuated by a cry of “This ain’t rock ‘n roll, this is genocide!” The first time they hear it, listeners won’t be able to stop themselves from leaping back and figuratively giving the album some space, but the hook it represents is big and attractive enough that no one will really walk away from it. They might be a little frightened, but listeners will find they’re unable to truly walk away; as some applause opens Diamond Dogs‘ title track, they’ll be pulled back in. …And, within the context of the singer’s catalogue, “Diamond Dogs” not only establishes the album, it establishes some fresh and new growth for Bowie as well. Here, listeners will easily be able to recognize a brand of raucous guitar rock similar to the sort they heard in songs like “Suffragette City,” but there’s more at work than just that. There is a little more comfort and ease here thanks in part to Tony Newman’s pocket-dwelling drums and the soul-adjacent horn section which embellishes the proceedings, but the really interesting development about the sound here rests with Bowie himself; not quite ready to really give himself over to the Soul he’d later prove he wanted very desperately to make (and would – in his own way – on Young Americans just ten months later on Young Americans) quite yet, he only hints at it coyly here – but still makes it sound like a damned good time – before testing the opposite end of the same spectrum with the melancholy “Sweet Thing” (which makes better use of the back-up singers that “Diamond Dogs also featured) before using both “Candidate” and “Sweet Thing (Reprise)” to drag both the tempo and the tenor of the record back up and so make the transition to “Rebel Rebel” – the barn-burning, mind-blowing, side-closing single – smooth, fluid and exciting. To this day, forty-two years after it was originally released, “Rebel Rebel” remains one of David Bowie’s greatest songs and calling cards, standing alongside “Space Oddity,” “Ziggy Stardust,” “Golden Years,” “Heroes” and “Fame.”Forty-two years later, the guitar hooks which opens the song is instantly recognizable and effortlessly sends endorphins coursing through the bodies of listeners – it is an absolute miracle of simplicity and the undying spirit of rock n’ roll. The lyrics mirror that “loud and bold enough to make parents cringe” spirit too; right from the beginning, Bowie encapsulates the danger and sexual re-invention that the glam scene embodied (“Got your mother in a whirl/ She’s not sure if you’re a boy or a girl” sum the whole scene up perfectly while “You like me and I like it all” imply the breakdown of gender roles and sexuality marvellously – and combined, they’d form the “challenge everything” battle-cry which would be so keystone to the foundation of UK punk just a couple of years later) and delivers it with a “How can you not see this?”bluntness that listeners instantly don’t just make listeners agree, it primes them to stand with the singer as a force against authority. The performance is very needs-first too; at four and a half minutes long, the rhythm figure is brick-thick, rock-solid and basically single-minded – the riff which opens the song also drives the verses and really only breaks for the chorus, and there is no solo. For all those reasons coupled with the obvious desire to shake convention, it could be argued that “Rebel Rebel” helped give shape and direction to punk rock at roughly the same time Iggy Pop and James Williamson launched the proto-punk masterpiece, Raw Power. After the phenomenal breakthrough of “Rebel Rebel,” the B-side of Diamond Dogs has a tall order to follow if it wants to leave the same kind of impression as the A-side, but it recovers fairly well with the closest to a rock n’ roll revival number that Bowie would ever write, “Rock ‘n’ Roll With Me.” There, the singer seems to actually try and play it genuinely and without a shred of irony as, over an almost glorious ‘Church of Rock’ backdrop, the singer confesses his love of the form without taking the pedantic route that Joan Jett would take seven years later on “I Love Rock N’ Roll,” and so makes it feel absolutely humble as a result – even if lines like “I would take a foxy kind of stand. While tens of thousands hold me in demand” are about as aware of Bowie’s star-power as it’s possible to get. Following that, the going gets darker with the self-explanatory “We Are The Dead” before fuelling some completely synthetic funk (complete with a string section) through “1984” and then diving into some sci-fi-informed social questioning which also hints at Bowie’s growing chemical dependance (see “Don’t talk of dust and roses – should we powder our noses” – the lyrics which open the song) before taking one last shot at a boisterous rock barn-burner in the form of “Chant of the Ever Circling Skeletal Family” which also feels a little tongue in cheek – given that the singer had already begun to move away from rock (as proven at different points in this very running). Looking back at it now, there’s a sense that this closing number is also intended to close a the book on the first part of the singer’s career; he’s ambitiously moving forward.